Well, here goes my first attempt at creating a character. I have little experience at making a build, so the build will probably need a little tweaking. With my luck, it'll probably either be really weak, or really broken powerful. Also, I did the build in Hero Lab's Demo version, so my math could be off a bit. This article also may require a little cleaning up. In Brief: Looks like a giant alien bug monster. Acts like a high-ranking military general of a warrior culture. Actually the former ruler of his entire world before he was double-crossed by duplicitous understudies. Girugon looks like a giant humanoid beetle-like monster with four arms, a horn sticking out of his head (kind of like the Rhinoceros beetle of Earth), a shell that protects his wings, rows of needle-like teeth hidden behind his mandibles, and glowing green compound eyes. While he looks like something out of a kaiju movie, those who assume that he is an unintelligent beast could not be further from the truth. He is in fact a member of an alien race of insectoids from another galaxy known as the Andromedans, though he is many times larger and more powerful than the average Andromedan thanks to a radioactive mutation. He typically wears a gold-colored traditional Andromedan warrior's sash, which has a functional purpose as a sheath to hold his weapons, as well as various medals he'd earned over his career, pinned to his very exoskeleton. Other than that, he typically wears little else. Ever since the day he was first hatched, Girugon was one of countless warrior-caste Andromedans training to fight, kill and die to in the countless wars between hive-clans that happened on the planet Churrux, in the Andromeda Galaxy. Each hive-clan was constantly fighting over territory in the harsh, highly irradiated world of Churrux, and each member of a hive-clan was expected to be completely, unquestioningly obedient to their hive-queen. Despite growing up in a staunchly collectivist culture, Girugon wanted more. He didn't want to just be another soldier, to be discarded and forgotten. He wanted his name to become legend. He wanted to see the stars. And although he kept his personal feelings a secret, he had long been frustrated by the self-destructive nature of the routine hive-clan wars that took place on Churrux. So he completed his training, and rose up the ranks until he was the Captain of his own war party. Then, on one fateful night during battle with another hive-clan gone horribly wrong, he was badly injured and left for dead by his own war party, who had forgotten about him in their hasty retreat. The heavily irradiated sinkhole where he fell into triggered a metamorphosis that lasted for a few weeks. He returned to his original colony... changed. Much larger. More powerful. More durable. And with a lengthened lifespan. Details are murky, but he soon garnered a well-earned reputation as the mightiest warrior his world had ever known, and already, increasingly elaborate stories detailing his exploits were made up. 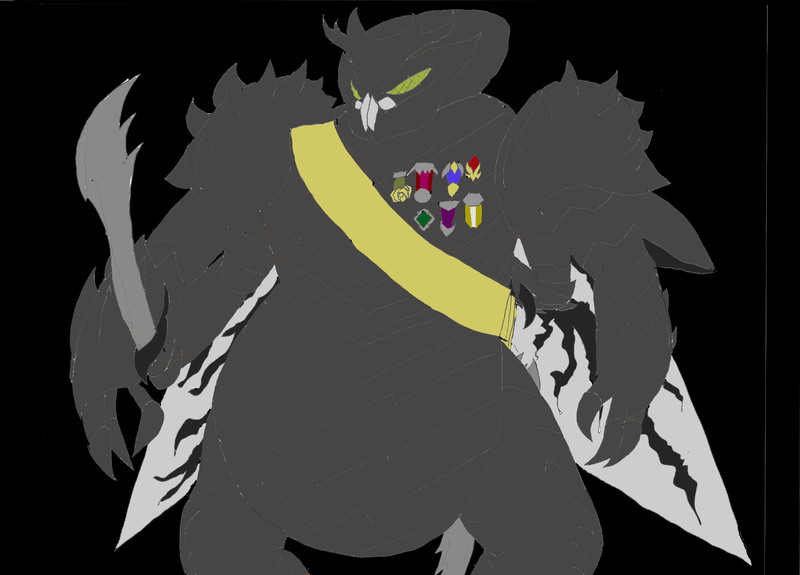 He eventually climbed to the rank of General, and proved instrumental in winning hive-clan war after hive-clan war until more or less the entire planet was under his rule as its Hive-King. He ruled alongside his consort, Hive-Queen Atayah, who rumors suggest may once have been a harshly abused worker-caste slave he took a liking to, and once he found out about her situation, he killed the abusive master, freed her, and took her in. Under Girugon and Atayah, the number of hive-clan wars were greatly reduced, the population more than tripled, and technological achievement flourished, even achieving a space program. However, he soon realized two things: not everyone would be satisfied with the decisions he made, and he never felt complete without an enemy to fight. But he didn't want to go back to the way things were. To solve this problem, he and his advisors set up the gladiatorial games to resolve disputes without resorting to out-and-out warfare. While he did preside over many of the games along with his beloved Atayah, would oftentimes compete in his own games, frequently coming out undefeated. However, as he got older, he had to deal with more challenges to his rule, and suggestions that the order he had founded go conquer the rest of the galaxy, which he refused every single time because he didn't want his people getting wiped out by biting off more than they could chew. Ultimately, one particularly hawkish advisor spiked his drink with a much more concentrated variant of the radioactive mutagen that changed him in the first place. As soon as he drank it, he grew and mutated very rapidly, losing his mind and becoming a rampaging kaiju. In his bestial state, he destroyed much, driven by a ravenous hunger for radiation until he took to the stars as a cosmic predator. A distraught Hive-Queen Atayah went into self-imposed exile as the advisor claimed Girugon's throne and declared himself absolute dictator of the entire world. The hunger for radiation took him across the stars, a mindless beast trampling over world after world, eventually getting to Earth. He landed on Monster Island, brutally beat a few kaiju that he encountered on his way off the island, and destroyed much of a small research facility stationed there. One of the few survivors managed to warn ASTRO Laboratories that the creature was headed towards the nearest populated area. After some brief observation, ASTRO Labs managed to evacuate the population of that populated area, and managed to extract the worst aspects of the mutation out of his system, despite him destroying a few buildings in the process while he was still berserk. When he came to his senses, he began to wonder just where he was, not recalling much of the destruction that he caused as a mindless giant monster. While he did question why enemy warriors would spare the life of someone like him, he has decided that it was time to try to atone for how the countless lives he may have trampled upon as a giant monster, and maybe just maybe, gather enough forces to reclaim his throne. Girugon has decades of experience in matters of war, and it shows. Possessing of a stern, militant, controlled confidence, and dignified to the extent of coming across as elitist most of the time, he tends to think of himself as being superior to most people, especially people who haven't proven themselves in battle, except in cases with beings that are quite obviously more powerful than he is, and not just in physical power. As someone who used to be both a military commander and the ruler of an entire planet, he's very much used to wording requests as orders he expects to be obeyed. However, he respects the concept of the chain of command and is perfectly willing to follow orders as well. If one were to look closer, however there are subtle hints that he operates on a bizarre warrior's code. He can appreciate seeing things like loyalty, bravery, and earnestness in other people. But one thing that hasn't changed though, and probably never will, is is love of battle. This guy lives for a good fight. He sees open combat as the one true way of determining a person's worth. Being an Andromedan from Churrux, he is naturally stronger, tougher, and more resilient than a normal human. But the radioactive mutation he has took that strength, toughness, and resilience even further than that. Though strong enough to lift two different cars with both top hands and rip through steel, and tough enough to withstand common military weapons, his real passion isn't only the art of war, but the art of wielding weapons. He's had four different weapons crafted for his personal use, each masterpieces of traditional Andromedan weaponry, one for each of his four arms. Two swords, one axe, and one mace. And he uses them to deadly effect. A residual effect of his days as a rampaging kaiju is the ability to absorb a tiny amount of radiation. Considering what happened last time, it's something that even he is privately concerned about. As for his fighting style, he tends to be pretty straightforward, though, being a former general of an army, he has picked up a few combat tricks. Rightful Hive-King Returns - He hopes to eventually gather enough resources to launch a military campaign to depose the treacherous advisor who overthrew him in the first place. Alien Bug-Monster - This obvious extraterrestrial looks like a giant insect. Of course people are going to be intimidated by him. This isn't helped by his rather bellicose personality. This goes doubly so for people who are afraid of insects. Pride - He possesses a kind of warrior's pride that makes him come across as arrogant and even warlike, perhaps even desiring to avenge any affront to said pride. The problems this can cause are rather self-evident. My Only Equal - He loves his Hive-Queen dearly, and she is the one person he won't talk down to. Scrap Happy - The universe will always be one big battlefield to him. Hence, he's very eager to get into any fights with an enemy whenever possible. Especially if waves of enemy soldiers are involved. Veteran of a Thousand Wars - As an experienced soldier, indeed, someone who was born warrior-caste, he tends to place the mission first, and, to a lesser extent, the needs of the group over the needs of the individual. As such, he may not be particularly towards people who have just gone through tragedy and loss, as he has seen similar things happen in his youth. Indeed, his attitude toward someone who has undergone an injury can be summed up as "If you can still fight, stop whining, because we have a battle to win." This may cause him to be viewed as heartless, or even having a lack of empathy.